Don’t buy it. Make it yourself. More fun and flavor are to be had! If you normally read something like the above in a food blog or publication and think to yourself, “sure, I should do that,” … but then, upon further and deeper thought, you say to yourself (honestly) … “Even though that looks great, in reality, I’m probably not going to make that any time soon,” … Let this blog post be the one to end that thought process. You have friends or family over, you put out hummus, they love it, and you tell them you made it yourself. You can easily dress this hummus up to look fancy. You can just as easily spoon it into a bowl and attack it with your dipping vessel of choice. Either way, It’s delicious and obviously better than anything you can buy in a store. Trust me. I wouldn’t let my Lebanese heritage down by steering you wrong on this one. 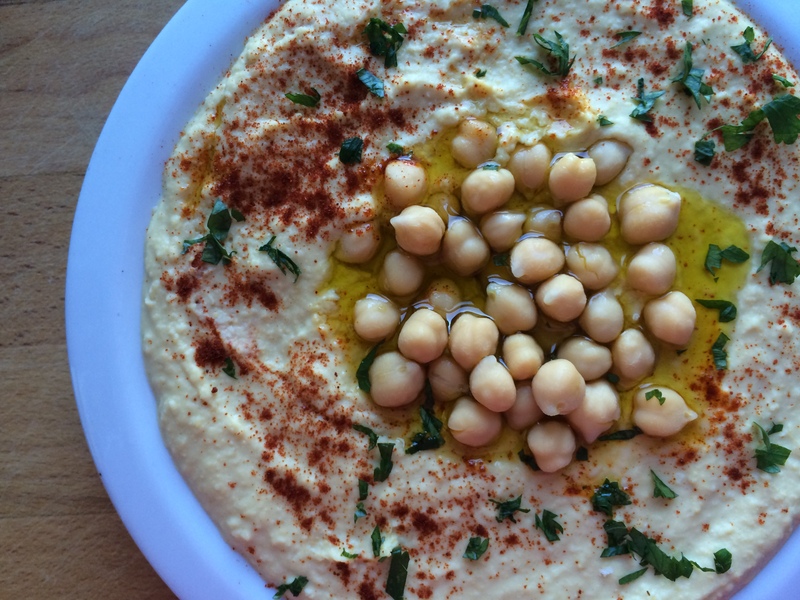 You’re going to love both eating this delicious hummus and making it. 1/4 cup olive oil, use the good stuff! First you want to peel your garbanzo beans. Take a garbanzo bean with the index finger and thumb and pressing slightly at the point closer to either edge of the garbanzo bean, squeeze into a bowl and discard the skin. Reserve 15-20 garbanzo beans for garnish. Add grabanzo beans, tahini paste, garlic cloves, lemon juice, 1/4 cup olive oil, water, cumin and salt to a food processor. Blend for 3 minutes. Scrape down the sides, and blend again for 1 minute or until smooth and cramy. Taste for seasoning and consistency. Add additional salt, lemon juice, or water as you see fit. Spread hummus on a serving plate. Drizzle with olive oil, top with reserved garbanzo beans, and sprinkle with smoked paprika and fresh parsley. Serve with carrot sticks, pita or pita chips. 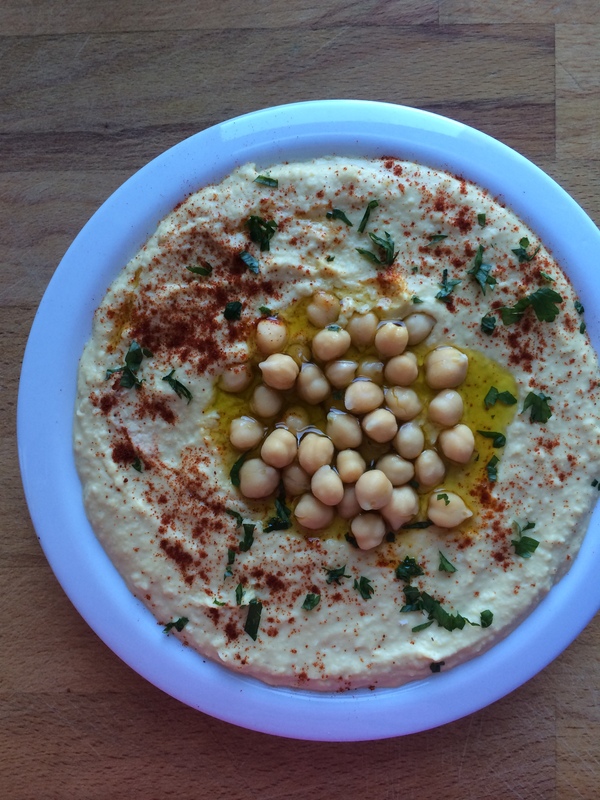 Note: Hummus can be stored in air-tight container in the refrigerated for up to 7 days. Emily, I remember when I was in junior high and your mom was pregnant with you. She and my mom would make hummus all the time together. I would come home from school and find them in the kitchen together and this is how I learned to make hummus. It’s so fun to see your blog and all your amazing recipes! Keep up the great work! Your photos are beautiful. Hi Gia! Thanks for the note. What a nice memory. 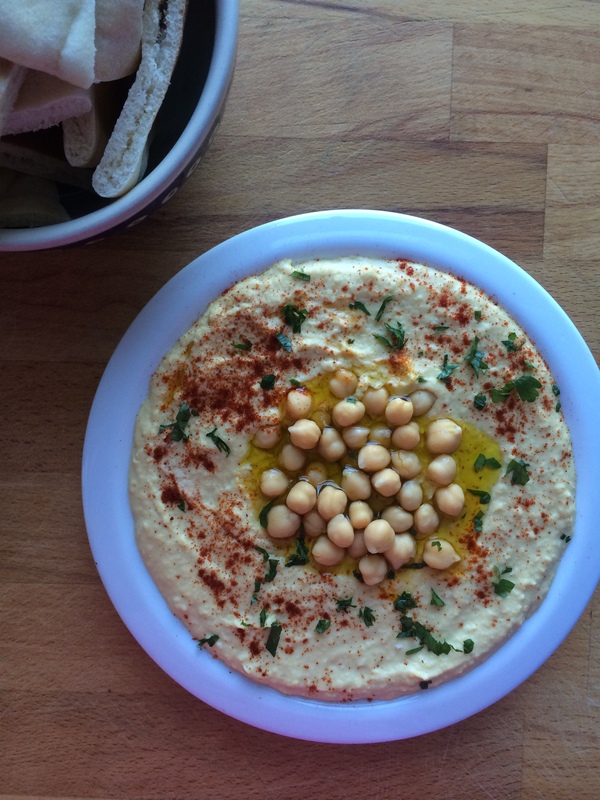 Hummus was a Bakken family staple growing up, still is. I am one of those people who keeps meaning to make hummus and never gets around to it – am hoping after this post things will change! Agreed! It is so versatile and customizable.